Founded in 1932 by Oscar H. Geiger, the mission of the Henry George School of Social Science (HGSSS) is to promote economic and social justice based on the philosophy of Henry George and his masterpiece, Progress and Poverty (1879). Today, the HGSSS offers tuition free courses and seminars at its headquarters in New York City and at one of the School’s dozens of satellite campuses around the world. 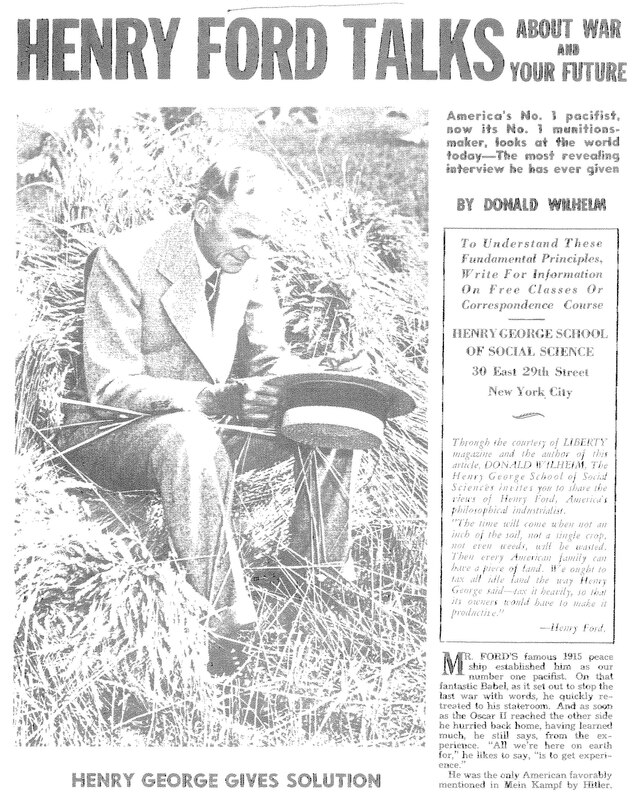 The following month, Geiger formed an advisory committee chaired by Frederic C. Howe and in March, the single tax periodical Land and Freedom published a feature-length article on Geiger’s plans for a school based on George’s teachings. By April a Board of Trustees had been formed and officers were elected. The Board chose Frederic C. Leubuscher to serve as President, Henry George’s youngest daughter Anna George de Mille as Vice President, and Joseph Dana Miller, editor of The Single Tax Review, as the School’s first Treasurer. In May of 1932, the Board of Trustees issued a circular appealing for money and Geiger began giving weekly lectures at the Pythian Temple in Manhattan and from his home on West 154th Street. He also kept a small office at the editorial headquarters of Land and Freedom. In September, the HGSSS received an educational charter from the State of New York. In early 1933, Geiger offered a 10-week course on Progress and Poverty. Fifty students enrolled. In July, the HGSSS moved into bigger offices with the help of one Geiger’s students, Leonard T. Recker, who paid the first year’s rent. By the fall of 1933, the enrollment had increased to 84 students. In April 1934, Helen Denbigh, President of the HGSSS Student-Alumni Council formed the Henry George Fellowship to serve as an “educational fraternity” dedicated to spreading the message of Henry George. 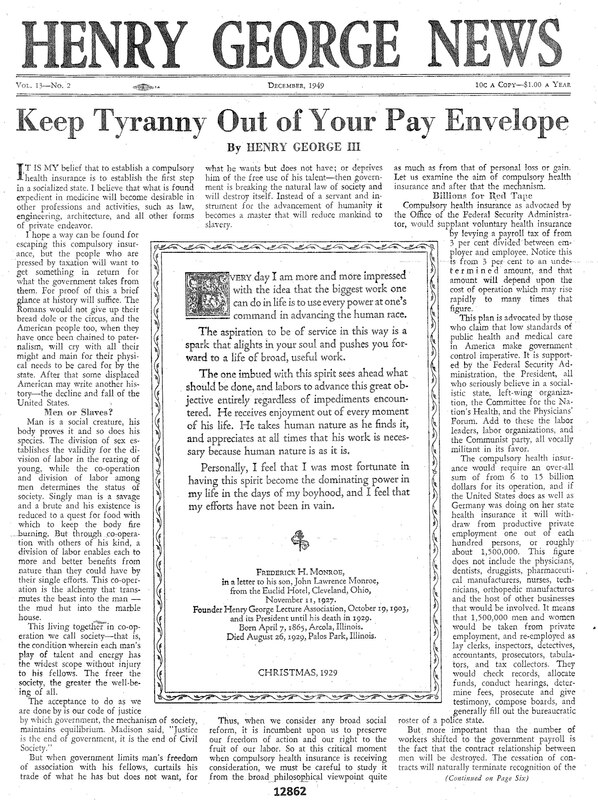 In 1935, the group began publishing a newsletter, The Henry George Fellowship News. By October 1936, the Fellowship counted 2,500 members. Following Geiger’s death on July 29, 1934, the Board of Trustees appointed Norman Fowles acting director. That same year, Henry L.T. Tideman and Julian P. Hickok formed satellite campuses in Chicago and Philadelphia, respectively. In 1936, Frank Chodorov became the full-time director of the School and publisher of a new monthly periodical called The Freeman: A Monthly Critical Journal of Social and Economic Affairs. While Chodorov intended the journal to simply “aid” the HGSSS as a separate entity, many viewed the Freeman as the official organ of the School. In 1940, HGSSS faculty member and Times reporter Will Lissner convinced Chodorov of the need for a “scientific journal in economics” to promote George’s ideas. With Chodorov’s help, the Robert Schalkenbach Foundation agreed to finance Lissner’s publication and in 1941, the first issue of the American Journal of Economics and Sociology (AJES) appeared. Throughout its 74-years, several former School officials served on the editorial board and contributed to the AJES including John Dewey, Otto K. Dorn, and George Raymond Geiger, son of HGSSS founder Oscar H. Geiger. In 1942, Margaret Bateman replaced Chodorov as director and after six years of publication, The Freeman folded and was replaced by The Henry George News. 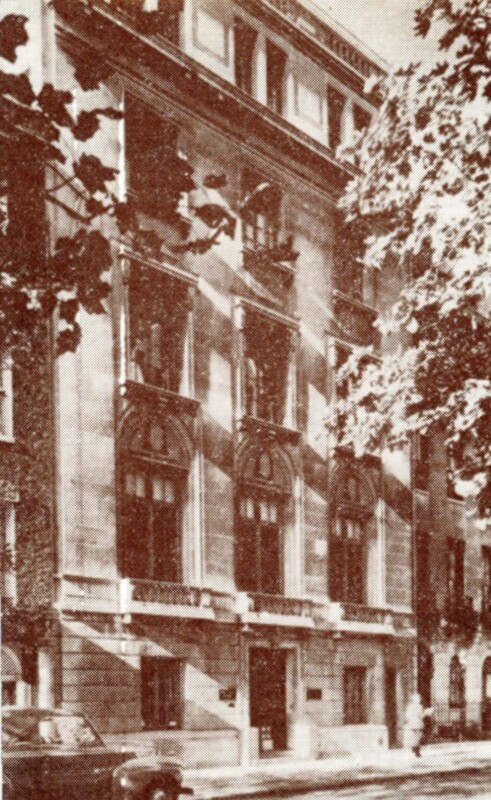 From its first issue in 1943, the new journal was “devoted to objective news reporting” on HGSSS and “Georgist activities in general.” In 1944 the HGSSS purchased a new building at 50 East 69th street and in 1946, Bateman resigned as director and Robert Clancy took her place, first as acting director and then in 1948, as director—a position which he held for more than 20 years. Anna George De Mille, President of the Board of Trustees and last surviving child of Henry George passed away in March 1947. Prior to her death, the University of North Carolina Press agreed to publish De Mille’s biography of her father, Henry George: Citizen of the World and when it appeared in 1950, the HGSSS hosted a celebratory dinner in her honor. (Series One and Three of the Henry George and Anna George De Mille Family Collection contain many of De Mille’s notes for the book). In his more 22 years as director, Robert Clancy played an instrumental role in the expansion of the School’s global presence in part by establishing a network of correspondence courses and sending delegates around the world to help establish new extensions. He also helped increase the presence of the School in New York City, with weekly dinners, film viewings, and other activities. In 1949, nearly 2,400 students enrolled in the basic course on Progress and Poverty and 1,021 enrolled in the School’s advanced courses. Two additional satellite campuses opened in Albany and in San Francisco. The same year, Dr. Henry George III, George’s grandson, donated the Bible his grandfather carried on his overseas voyages as well as the pen with which he wrote The Science of the Political Economy. Additionally, the Metropolitan Museum of Art donated a life-size portrait of Henry George painted by George de Forest Brush and the School acquired an author’s edition of Progress and Poverty of which only 500 copies were printed. The aforementioned items are displayed at the Henry George School of Social Science in New York. The HGSSS continued to experience steady growth throughout the early years of the 1950s. By 1952, the School boasted 65,000 graduates, 12 satellite campuses in the U.S. and Canada, and six locations outside of North America. That same year, the Board of Trustees named Dr. Eduard C. Lindeman, a lecturer at the New School of Social Research and pioneer in adult education, honorary president of the HGSSS. 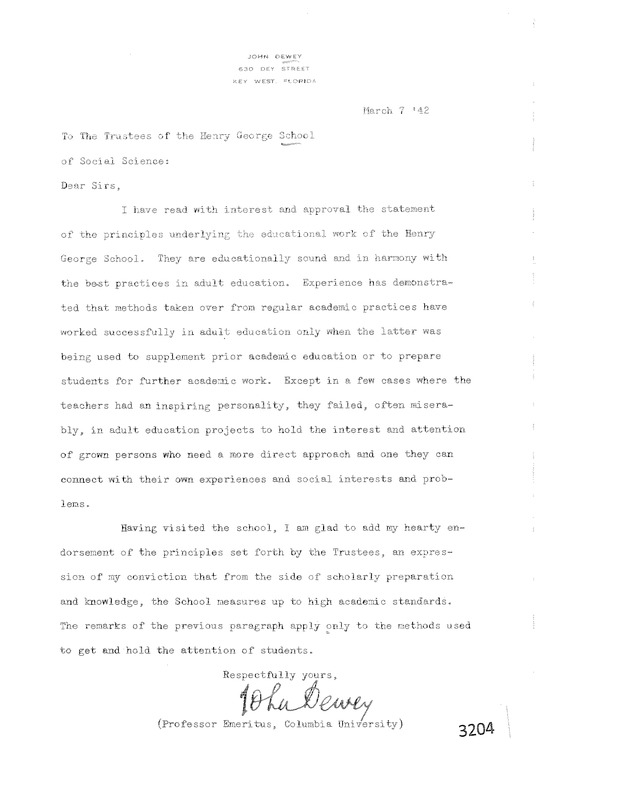 In 1954, the School held its first high school essay competition, open to all high school graduates who took at least three courses in economics at the Henry George School. That same year, Agnes de Mille, Henry George’s granddaughter, was elected to the HGSSS Board of Trustees. From 1954 until her death in 1993, Agnes de Mille played an essential role in the governance and expansion of the HGSSS. In 1957 she helped the School purchase and renovate the Birthplace of Henry George in Philadelphia. Agnes de Mille donated many of the items found in the Henry George Birthplace Portrait, Textile, and Artifact Collection including a dress worn by her grandmother, Annie Corsina Fox George. Her involvement in the 1957 rehabilitation of the Birthplace is documented in Series One of the Henry George Birthplace Rehabilitation and Restoration Projects. More than 250 people attended the HGSSS Annual Banquet of 1965, which also featured a 40th anniversary celebration of the Robert Schalkenbach Foundation —the main publishing house of works by Henry George. In 1967, the HGSSS hosted its annual conference in Montreal and new extensions formed in Long Island and Costa Rica. After more than 20 years at the helm of the HGSSS ship, in 1968 the Board of Trustees placed Robert Clancy on administrative leave. Two years later, Arnold Weinstein became the seventh Director of the HGSSS. Under the leadership of Director Weinstein and his successor, Stan Rubenstein, the HGSSS emphasized a “back to basics” approach to education. In addition to boosting enrollment in the Fundamental Economics course, the School began offering other courses in economics including Money and Baking and the History of Economic Thought. Additionally, new teacher-training seminars on political economy were offered at HGSSS headquarters in New York. In 1976, Philip Finkelstein replaced Stan Rubenstein as Director and in 1977, the School created the Center for Local Tax Research to gather relevant statistical information and analysis on the land question. School officials spent a large portion of the years 1978 and 1979 preparing and executing the Centennial Celebration of the publication of Progress and Poverty, held in San Francisco. To mark the occasion, the New York Public Library offered a special exhibition on the Henry George Papers and the HGSSS and RSF published a Centennial Edition of George’s famous work with a new preface authored by his granddaughter, Agnes de Mille. (For more on this celebration, see The Henry George and Progress and Poverty Anniversary Celebrations Collection). In 1980, the HGSSS moved from the E. 69th street location to a new building E. 44th Street. That same year, the Center for Local Tax Research published a study asserting that NYC would gain an extra $250 million per year by increasing land assessments to half their estimated value. The following year, the School held a joint conference in Santo Domingo, Dominican Republic with the Lincoln Institute for Land Policy. Following the unexpected death of Philip Finkelstein, the Trustees elected Stan Rubenstein HGSSS Director. 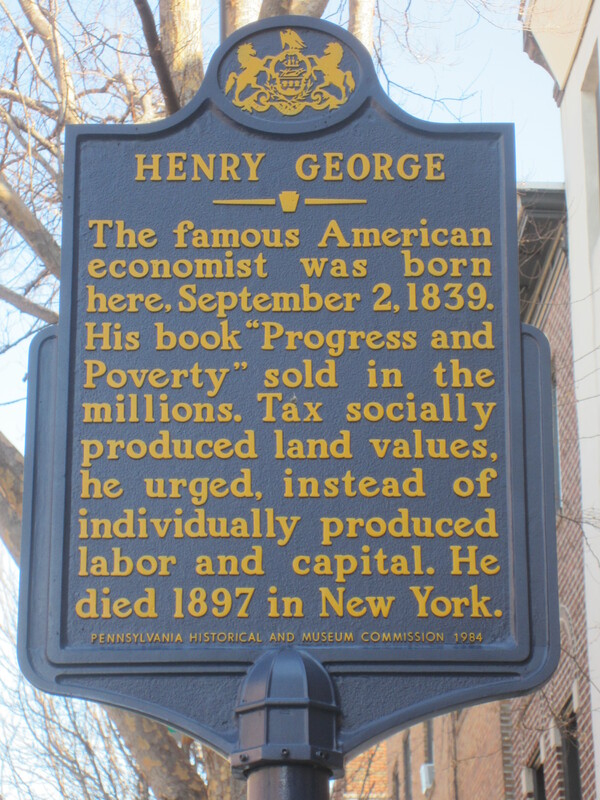 In 1984, the City of Philadelphia approved the erection of a historical marker in front of the Henry George Birthplace at 413 S. 10th Street, which reads: “Henry George: The famous American economist was born here, September 2, 1839. His book “Progress and Poverty” sold millions. Tax socially produced land values, he urged, instead of individually produced labor and capital. He died 1897 in New York.” Six years later, in 1989, the School co-hosted an International Henry George Sesquicentennial Conference in Philadelphia to commemorate the 150th anniversary of George’s birth. Several events were held at the Birthplace, which had been restored to its 1839 appearance. In 1988, the HGSSS moved its New York headquarters to 121 East 30th Street, where it remained until 2014. George Collins replaced Stan Rubenstein as Director in 1989. Collins also served as the Executive Director of the HGSSS Extension in Philadelphia. In 1991, the School held a joint conference with the Robert Schalkenbach Foundation on the Social Collection of Rent in Eastern Europe and the USSR. Scholars from all over the world attended this conference. Throughout the 2000s, under the leadership of Mike Curtis, Director of Education, the HGSSS continued to offer free courses and seminars (in English and Spanish) at School headquarters in New York and around the country. In addition to Basic and Advances courses, School officials began offering Enrichment Courses on a variety of topics including the Evolution of Economic Thought and the Rights of Property. In late 2014, the HGSSS sold the building on East 30th Street and relocated to offices at 5 West 19th Street. The late Andrew Mazzone led the School from 2013 until his death February 21, 2017. Among his many achievements included the re-opening of the Henry George Birthplace as a historical archive and Smart Talk, a series of wide-ranging video interviews with prominent scholars and social thinkers. In July 2017, the School moved its headquarters to 149 East 38th Street. Robert Clancy, “The Henry George School’s First Twenty-Five Years, The Henry George News (January-April, 1957). Lancaster Greene, “Farewell Freeman. Hail Henry George News!” The Freeman 10 (August, 1943), 2. 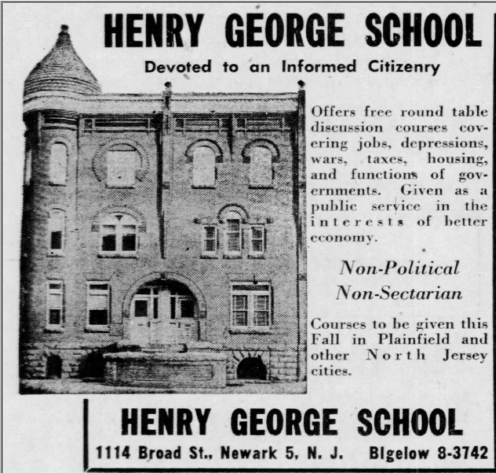 “Henry George School Buys Bigger Building,” New York Herald Tribune (August 11, 1938), 3. John Dewey, “An Appreciation of Henry George” in Significant Paragraphs from Progress and Poverty By Henry George (New York: Robert Schalkenbach Foundation, 1935). See “Denies Charge of Appeasement: Henry George School Will Welcome Inquiry” The New York Sun (February 4, 1942). “LaGuardia Says He’s Disciple of Henry George,” New York Herald Tribune (August 31, 1939), 14. Will Lissner, “On this Journal’s 40th Anniversary,” The American Journal of Economics and Sociology 40 (October, 1981), 322. The Annual Report 1949 of the Henry George School of Social Science (New York: Henry George School of Social Science, 1949). B. 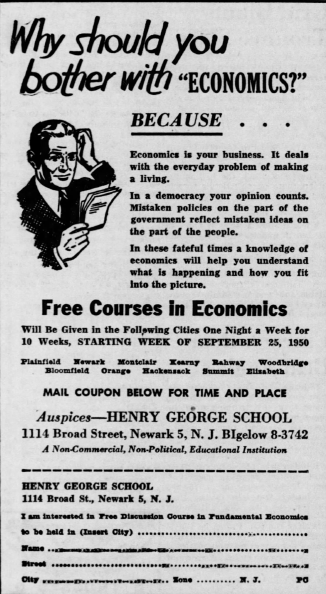 B. Rowe, “A Free Private School for Adults: Henry George School of Social Science in 21st Year,” The New York Herald Tribune (October 5, 1952), A6. “Going On in New York,” The New York Herald Tribune (September 15, 1952), 16. “Wins Economics Prize: Boys High Graduate is First in George School Essay Test,” The New York Times (October 13, 1954), 22. 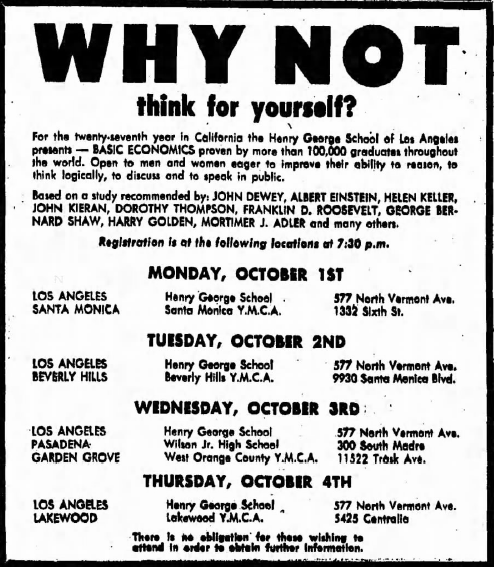 “Conference Here to Mark Henry George Anniversary,” New York Times (August 31, 1964), 50, and Edward C. Burks, “Let George Do It, Tax Critics Urge: Disciples of 19th Century Thinker Convene Here,” New York Times (September 3, 1964), 25. Robert Clancy, “Annual Report of the Henry George School, 1964” (New York: HGSSS, 1964). 1. Robert Clancy, “Annual Report of the Henry George School, 1967” (New York: HGSSS, 1967), 1. Stan Rubenstein, “Report on the Henry George School.” Paper presented at the 13th Annual Conference on Land-Value Taxation and Free Trade (Douglas, Isle of Man: September 1973), 1. Center for Local Tax Research, Effective Real Property Tax Rates in the Metropolitan Area of New York (New York: Center for Local Tax Research, 1980).